Emma Carlson Berne. Under Pressure. Minneapolis: Darby Creek, 2013. The title, Under Pressure, nicely sums up Elise Heisel’s life–or maybe just how she sees it. Elise comes from a family of UNC Tar Heels. Four generations of her family have gone to UNC and made good. Her dad was president of the student body in his senior year, and her mother was a star player on the women’s rugby team. Elise dreams of going to UNC and playing for the university’s women’s soccer team. She is an excellent ball handler on the soccer field, but when Elise compares herself to her teammates, she thinks that she lacks stamina and power. When her high school coach announces that a UNC scout is coming in two weeks to check out the team, Elise goes into a panic. What can she do to make herself stand out? Elise succumbs to the lure of performance enhancing drugs. When they seem to loose their edge, she decides that it must be because she is carrying too much weight. In just two weeks, Elise jeopardizes her health, her friendships, and her dream of playing for Carolina. 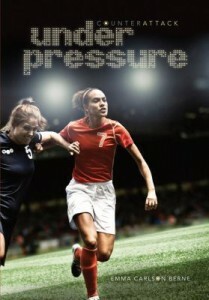 Under Pressure is a realistic portrayal of how quickly a teen can get in trouble, and the ways family and friends–consciously and unconsciously–affirm or denigrate a girl’s sense of self-worth.